String the nuts and hang in the house for luck, or present a batch of them to a bride to wish her good fortune. The nuts, eaten give wisdom and increase fertility. They are often eaten prior to divination. On can be carried for increasing fertility. Hazel crowns were also worn to induce invisibility. Twigs of hazel are placed in window frames to guard the house against lighting, and three pins of hazel wood driven into your house will protect it from fire. Hazel wood can be used to make fine all purpose magical wands but also for reconciliation. Quickly lessens hostilities between people. Two twigs tied together w/ red or gold thread to form a solar cross were used for a good luck charm. Draw a circle around you with hazel if in need of protection. Used for fertility and wisdom and in divining rods for finding lost objects. 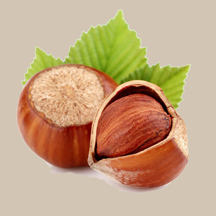 Natural hazelnut oil is an increasingly popular nut oil, usually cold or expeller pressed from roasted hazelnuts, which may be alternately called filberts. It’s not the easiest oil to find, and it is fairly expensive. Most brands of hazelnut oil are exports from Turkey and parts of Asia where the hazel tree is native. A few brands of hazelnut oil are made in the US and come from Washington or Oregon and a few made in France. It is popularly used in baking and as salad oils. But our hazelnut oil is a fragrance, do not use in cooking! Use our oil to blend with other spicey oils or our chocolate fragrance oil for warm and soothing smells for your rooms, especially around the holidays.